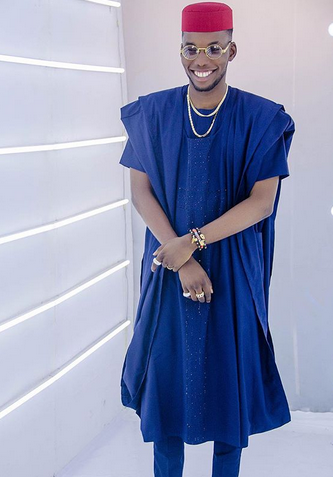 Lol, Wettin You get a crooner, Victor AD brings all glory back to God as he pays millions to perform on shows. 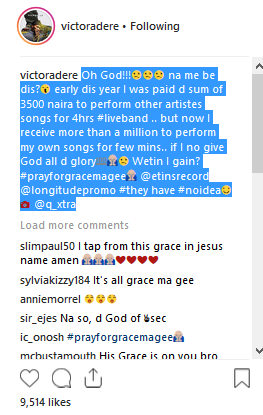 At the beginning of this year, the singer received only N3,500 to play other artist songs for 4 hours. But now he storms the stage for a few minutes to play his own songs and he's paid in millions. He concluded, "If I do not give all the glory to God, I will win." Lol, my brother na you lose o. Well done! Good testimonial !!! "Oh God !!!" I'm dis? 😫 Early in the year I was paid the sum of 3500 Naira to perform other artist songs for 4hrs #liveband .. but now I get more than one million to perform my own songs for a few minutes ... if I do not honor God all give? # prayforgracemagee🙏 @etinsrecord @longituepromo # You have # noidea😊 📷 @q_xtra, '' he wrote.